CARMEL, Calif. – August 2018 – Award-winning sculptor and Automotive Fine Arts Society member Tony Sikorski will debut six dynamic original sculptures during the Pebble Beach Concours d’Elegance on Sunday, August 26th in Carmel, California. This is the 21st year that Lincoln Motor Company will sponsor the AFAS exhibit on the Pebble Beach show field. This year’s theme might be considered a “license to thrill” as Sikorski has transformed classic nostalgia into contemporary art. This is but one of six bold presentations made by Sikorski for this year’s Pebble Beach exhibition. Five of those six focus on competition cars, while the sixth represents commercial trucking of the era, in a medium that wholly speaks to the muscularity of the era. In gazing upon the truck and its footprint, you can fully appreciate its brute power – and, as was typical of the time, its lack of power steering. 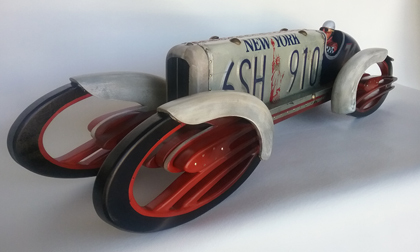 Tony’s award-winning art has been displayed at numerous invitational motor sports art exhibitions. Additional information on Tony’s art can be found at this website.